Unlike Marlin and most other firmwares, RepRap Firmware does not require recompilation for different printers. The changes that you would normally make to configuration.h in Marlin are now all made with gcode. At the most basic level you can type gcode commands into pronterface each time you want to setup the printer - however that would quickly get very tedious. Instead the printer configuration is set within /sys/config.g on the SD card. This tutorial will walk through the common parts of config.g for a Mendel90 style printer with dual extruders. If you have a single extruder printer then the comments will highlight what to leave out. It is assumed you are using DC42's fork of the RepRap Firmware and was written while version 1.00f was the most current version. It is helpful if you refer to the gcode page on the reprap wiki as you follow along. The order of the commands is not always strictly important however in some cases it is, for example you should define your tools before setting their offsets. Where The command is an "M" command, with the switch "P" and the information "Mendel90". This sets the printer name to "Mendel90". You should set the IP address to be within the same subnet as your network, and not to an address that could be allocated to something else (eg, outside of your DHCP range). The MAC address should not be the same as one already on your network. M83 sets the extruder to relative extruder moves which is intuitive when sending gcode commands by hand to move the extruder - for example when doing calibration. Cura (and Slic3r by default) expect gcodes to be absolute, rather than relative so I add M82 to the start.gcode to ensure when printing the firmware is in absolute gcode mode. The Duet and Duex4 have digital control of the stepper current - this is set with M906, note the extruder parameter is delimited with a colon ":", this allows for different currents to be set of each extruder drive. This same delimitation is used for M92, allowing different extruder steps/mm to be set for each drive. M569 sets the axis direction, in this example the printer is wired up in such a manner that X and E0 move in the +'ve direction when a positive movement is send, however Y,Z and E1 move in the negative direction. To correct that the switch "S0" is used, after this command a positive movement to Y,Z or E1 will move them in a positive direction. M566 is the minimum or instantaneous speed change numbers, they are referred to as X,Y or E Jerk in Marlin. In all these cases I have used a single number for E, that sets the same for all extruders. if your extruders have different designs then you may want to set different speeds and accelerations for each one. M305 sets the heater thermistor information. P1 = hotend 0, P2= hotend 1, P0 = Heated bed. R1000 = a 1K bias resistor, if you are using a RepRapPro Duet then use R4700 as they use a 4.7k bias resistor. T100000 = 100K @25C thermistor. Finally all heaters are set to -273C by default so the M140 sets the bed to 0 active, 0 standby at startup which helps when using a control panel such as the PanelDue to control the printer. The hotend stat values are set later. defines tool number 2 which uses the second drive (D1) and the third heater, which is the E1 heater (H2). The third tool define is where it gets interesting and shows off the potential power of this method of defining tools. This defines tool 3 to use both drive 0 and drive 1, but just heater 1. This sort of tool would fit a hotend like e3d's Cyclops. 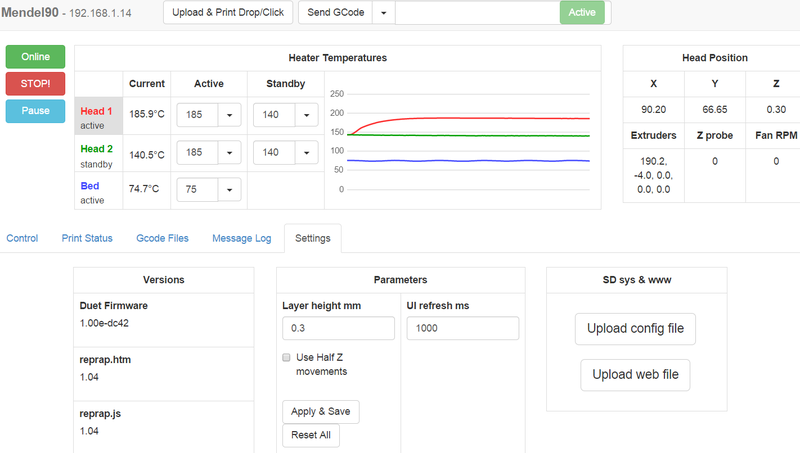 RepRap Firmware can use G10 to set temperature and position offsets. Which would keep the hotends centered around 0,0 - better for a delta printer. That concludes the config.g settings required for a standard cartesian printer. This routine will home quickly until the endstop is reached, the back away and home slowly until its reached again. It makes use of the addition "S1" to the G1 command which stops when an endstop is triggered. Note that our mendel90s home to Max on all axis. Note the "G1 X100 F6000 line before the Z home. This means that the X carriage will be centered before homing Z, ensuring that the bowden tubes pass easily out of the enclosure. to wait for tool 1 to get to temperature before continuing with the print. in Tfree1.g to move the extruder outside of the object being printed before changing tools. DC42 is working on further macros, specifically for Delta printers and probing. Examples of these can be seen here. You can also view the current config.g contents in the web interface.